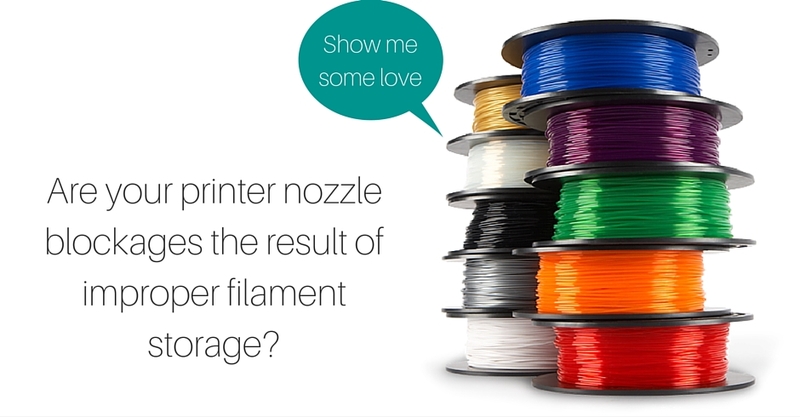 3D Printer Filament Storage: Are You Doing It Correctly? Are you experiencing any of the following 3D printing problems: 3D printer extruder clicking; 3D printer filament bubbling or hissing during printing; weak and brittle printing results? If the answer is yes, then I would recommend you take a closer look at your 3D printer filament storage solution. Probably the most common mistake made in the desktop 3D printing community, is not giving careful thought to 3D printer filament storage. If you are not storing your 3D printer filament in a moisture free environment, then you are going to experience a number of 3D printing problems. The most common of which is your 3D printer extruder clicking. [Read more…] about 3D Printer Filament Storage: Are You Doing It Correctly?